Alice Hohenberg Federico, a New York artist and a Selma, Alabama, native, will present an exhibition of her ceramic works, The Liberation of Clay, at the Sarah Moody Gallery of Art November 29, 2018 – January 11, 2019. Federico will present a lecture on her work Wednesday, Nov. 28, 6-8 pm in 205 Gorgas Library. 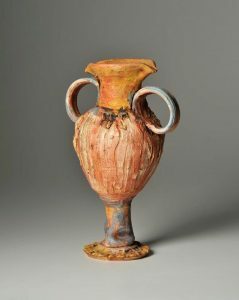 The public is invited to the opening reception for the exhibition, Thursday, Nov. 29, 5:00 to 7:00 p.m.
Federico works on the potter’s wheel to create sculptural vessels that transcend function and, as she puts it, “are metaphors that are abstractly figurative.” Her vessels are influenced by ancient Greek vessels as well as a fascination with potter Lucie Rie’s work. “Pieces are pulled and twisted, wrapped – they are expressive, singular. To me, some are even imperfectly perfect.” Federico is represented by George Billis Gallery, New York, NY. A catalog of works in the exhibition with an essay by art historian and critic Vered Lieb is available at the gallery. Selections from the Permanent Collection of the Sarah Moody Gallery of Art at The University of Alabama will be on display in conjunction with the Federico exhibition. The Permanent Collection is dedicated to works on paper including prints and photography. Paintings, drawings and small sculpture will also be featured. Image credit: Alice Hohenberg Federico, “1320,” white stoneware clay, 14 inches high.